Yulia Van Doren, soprano; Krisztina Szabó, mezzo-soprano; Charles Daniels, tenor; Tyler Duncan, baritone; Vancouver Cantata Singers; Paula Kremer, artistic director; Pacific Baroque Orchestra; Alexander Weimann, music director; Vancouver Playhouse, December 2, 2017. Melanie Krueger, soprano; Emma Parkinson, mezzo-soprano; Isaiah Bell, tenor; Gregory Dahl, baritone; Vancouver Bach Choir; Vancouver Symphony Orchestra; Leslie Dala, conductor; Orpheum Theatre, December 9, 2017. Period instruments or modern instruments? Smaller chorus or larger chorus? Faster tempi or slower tempi? These questions have dogged the performance of Baroque music for several decades, and the answers are usually presented in absolute terms, as if one approach – historically-informed performance or conventional ‘modern’ performance – were necessarily better than the other. However, it is worth considering that either performing style may be effective in communicating the music, conditional on considerations such as venue size, acoustics, and performer capabilities. 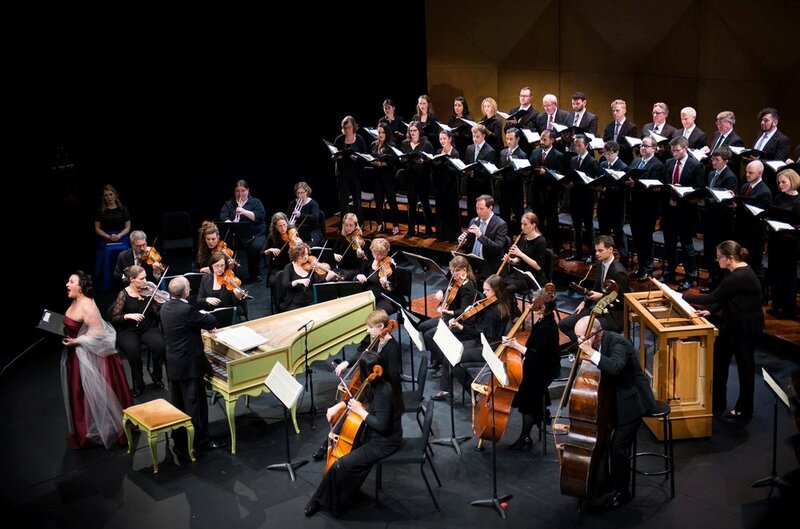 In the past two weeks, Vancouver audiences had the rare opportunity to experience two contrasting approaches to Handel’s Messiah: Early Music Vancouver’s historically-informed rendition, with the 40-strong Vancouver Cantata Singers and approximately 20 musicians playing on authentic instruments in the intimate space of the 668-seat Vancouver Playhouse, and the Vancouver Bach Choir’s more traditional performance, featuring about 80 singers and 30 musicians from the Vancouver Symphony playing on modern instruments in the grand confines of the 2780-seat Orpheum Theatre. Both performances had the benefit of conscientious orchestral support under the direction of experienced conductors. Under Alexander Weimann, the Pacific Baroque Orchestra played with a clarity and transparency that ensured the audibility of every note of the music and every word of the text. The period oboes and bassoon blended beautifully with the strings, and the continuo accompaniment to the recitatives was imaginatively and tastefully realised, with sensitive organ playing from Christina Hutten. Aside from a few moments of strain in the instrumental part of “The trumpet shall sound,” the orchestral contribution to the evening was impeccable. It was ideally suited to the intimacy of the Playhouse, though it would have felt underpowered in a larger space. At the Orpheum, Leslie Dala also coaxed the members of the Vancouver Symphony Orchestra to a crispness and lightness of touch on their modern instruments. This prevented them from overwhelming the solo singers, though they were certainly able to summon sufficient volume to match the larger choral forces in the more demonstrative passages. The sound of the trumpets and kettledrums cutting through the large hall was particularly thrilling, and would probably have been impracticable on period instruments. From the standpoint of the choral contributions, special praise must go to the Vancouver Cantata Singers, one of the city’s outstanding semi-professional vocal ensembles, for the effortless virtuosity they brought to Handel’s demanding choral writing. Despite the challengingly fast speeds adopted by Maestro Weimann, the sixteenth-note coloratura writing in such numbers as “For unto us a Child is born,” “All we like sheep,” and “Let us break their bonds asunder” had a razor-sharp precision that was breathtaking. The Vancouver Bach Choir was also well balanced with the VSO instrumentalists, but it is regrettable that tenors and basses comprised less than a third of the total number of singers; in the fugal movements like “And with his stripes we are healed” and the concluding “Amen,” the men were sometimes overpowered by the sopranos and altos. In general, the Bach Choir made the strongest impression in the massive homophonic moments such as “Glory to God in the highest,” “Lift up your heads, O ye gates,” and “Worthy is the Lamb,” where their sumptuous sound could produce the greatest effect. In both performances, the quartet of soloists – comprising internationally-recognized singers with excellent Baroque credentials – had their share of strengths. At the Playhouse, we heard soprano Yulia Van Doren, who was at her best in the tender lyricism of “He shall feed His flock like a shepherd” and “I know that my Redeemer liveth,” rather than in the more extroverted numbers such as “Rejoice greatly.” Tenor Charles Daniels, a distinguished Handel veteran with more than a hundred Messiahs to his credit, brought his characteristically deep understanding and intense delivery to his arias. The baritone, UBC alumnus Tyler Duncan, combined a remarkable ease of projection with smoothness of tone. Whether in the bombast of “Why do the nations so furiously rage together” or the hushed intensity of “The people that walked in darkness,” his voice carried effortlessly over the instrumental ensemble. At the Orpheum, soprano Melanie Kruger likewise gave a sensitive performance of “I know that my Redeemer liveth,” while mezzo-soprano Emma Parkinson’s smooth legato and lovely tone were put to good use in “O thou that tellest good tidings to Zion” and “He was despised and rejected,” Tenor Isaiah Bell’s tone was arguably more beautiful than that of his counterpart from the Playhouse, even if he was not quite able to match Mr. Daniels’ powerful communication of the words. There is no doubt that the traditional “big band” approach to the Messiah can often achieve a more thrilling resonance and grandeur, something that will enshrine it in the hearts of many. Nonetheless, the principal benefit of hearing the oratorio in a smaller venue is that is allows the four soloists to project more tellingly, and puts us closer to their story. It is always possible to increase the size of the chorus and orchestra to fit a larger venue, but solo voices must always remain solo voices; it is no easy task to carry a Baroque aria to the ends of a 3000-seat hall. To be sure, a traditional approach can realize the spirit of the work most effectively, yet it seems to me that the historically-informed approach is an equally rewarding – and sometimes revelatory – alternative. One can only rejoice at the current opportunity to absorb Handel’s genius through two alternative lenses, each providing their own choral, orchestral and soloistic splendour.